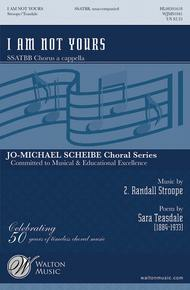 I Am Not Yours (Jo-Michael Scheibe Choral Series). Composed by Z. Randall Stroope. For Choral (Sop 1/2 Alto Tenor Bass 1/2). Walton Choral. 16 pages. Walton Music #WJMS1041. Published by Walton Music (HL.8501618).Another masterful work from Z. Randall Stroope! A lush, deeply emotive setting of Sara Teasdale's achingly beautiful poem results in another concert stunner whose musical power belies the accessibility of the vocal lines in all parts. Truly magnificent!